Just when investigative photojournalist Christopher Haslett thought his latest research on smuggled chimpanzees was mostly over, he turned to the internet to fact-check and finalize his findings. "I put away my hidden cameras and other investigative equipment and began tying up some loose ends with Internet research," he wrote. "At some point I drifted onto Instagram." What he found on Instagram was staggering. A booming population of baby apes and orangutans looked out at him from the gleaming screen. Some of them were surrounded by junk food. Others were dressed up in outfits. Still others were posed with a cigarette. Haslett, who lives in Kenya, noticed that the photos come mainly from Instagrammers in wealthy Arab Gulf nations. When Haslett reached out to veterinary contacts in the region, none knew of any accredited breeding facilities in existence there. Haslett then did some digging into the complex nuances of CITES regulations of international wildlife trade to see how importing these animals to keep as pets was possible. CITES (the Convention on International Trade in Endangered Species of Wild Fauna and Flora) is an international agreement that is supposed to ensure that international trade of animals and plants does not threaten their survival. It turned out that because of wildlife trade regulations, there is no legal way for ordinary Gulf citizens to import apes. The number of baby apes showing up on Instagram feeds simply does not match the number of apes exported to the Gulf countries in the past decade, according to Haslett. For orangutans, the data shows that not even one orangutan has entered any Gulf State (Kuwait, Bahrain, Iraq, Oman, Qatar, Saudi Arabia and the United Arab Emirates) since 2005 with a CITES permit. "It's reasonable to conclude that the Gulf apes were illegally gotten," he wrote. "But how?" Haslett explored the Instagram account called Amazon Pet, which shows exotic animals of all kinds. One video clip shows a child pulling a leash; a young cheetah is at the end of it. Another shows a young ape climbing up the side of a birdcage. Yet another shows a baby chimp attacking an emu. The list of disturbing clips and images goes on and on. Amazon Pet has over 500 other posts like this. More than 43,000 people follow Amazon Pet. The account connects to WhatsApp, which, Haslett found, is an app preferred by wildlife sellers on Instagram. He thinks that these sellers find the app's privacy and cheapness a major plus when conducting transactions. "This was no gag," Haslett wrote. "Amazon Pet is a serious business offering a wide range of exotic animals to people in the United Arab Emirates." Interest in exotic pets has always existed in the Middle East, but what's changing is the number of new millionaires who have the means to acquire and afford them, and the ease of technology to facilitate their desires. "Hi, I am looking for a baby monkey," one Instagrammer commented on a video of a baby chimp. "Do you have any born baby available and where is your location in Dubai?" Sadly, the desire for an exotic pet often overrides any sympathy or concern for the impact on the animals sold into private homes. Because primate mothers aggressively protect their young, prying a baby away from her often involves violence. Conservationist Karl Ammann has estimated that 10 chimpanzees must be killed to get one baby suitable for selling. "These babies also face a potentially dismal fate," Haslett wrote. "Like the pythons that outgrow their owners' homes and are dumped in the Everglades swamps, apes lose their cute appeal as they grow out of childhood. 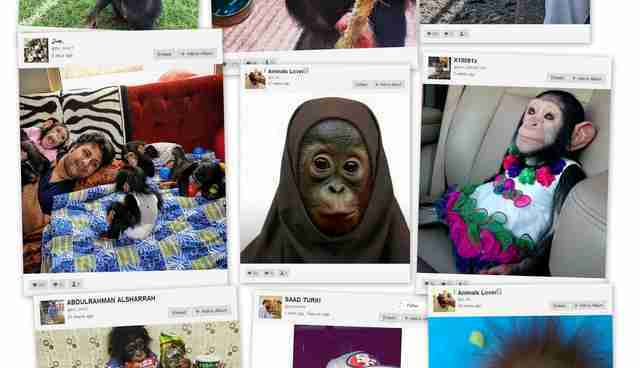 Instagram is awash with snaps of diaper-clad baby chimpanzees and orangutans, showered with toys and treats by their proud owners. Yet chimps should live about 60 years in captivity, orangutans about 50." At the time the Mongabay's article on the investigation came out (December 10), neither Instagram, nor Facebook, its parent company, had responded to requests for comment on Haslett's discovery. As of December 14, Instagram did not immediately reply to The Dodo's request for comment. Amazon Pets did not immediately reply to The Dodo's request for comment. Read Mongabay's full story of the investigation here.